In terms of “hardware”, this involved buying a car, getting additional furniture, making puja tables and beds, getting our kitchen set-up, our library, phone system, e-mail, website, etc. 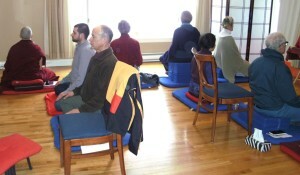 bi-monthly Sojong practice; a monthly monastic training day. But since our transition period seems to coming slowly to an end, we feel that we are now ready to open up our doors to others even further. We would therefore like to invite two practitioners, preferably Vajrayana practitioners, to come live with us in Fall River. For details, cost, etc., please call or e-mail us. At the same time it is now also time to look further into how to establish KCCL on a sound financial basis. Having covered mainly by ourselves the cost for the move to Fall River and the transition period in the last three months, we will now slowly have to establish and cultivate a support group that will financially help us support KCCL so that it can continue for many years to come and provide a space for people to join in. As monastics we will not need much for ourselves while at the same being able to devote much of our time to serve others, but to upkeep a center that provides an uplifted and suitable space for others to join in needs additional financial support (while at the same time keeping an eye open towards a more self-supportive model of running a monastic setting than it is customary in Asia). Thus if you have the means and willingness to financially support us, you can find the necessary info to do so “here”. Last but not least, even though KCCL is presently based on our three tracks approach, please let us know what we further could do to meet your needs or share with us your ideas regarding practice, study or how to join in with us and others.